These three wines, one each from France, Spain and Italy are wonderful examples of richly flavored wines from the old world, each unique and remarkably pleasing and under $50 on the shelf, if you are looking for good value and class, these stylish wines are certainly worth exploring, they all drink great now and would be nice mid term cellar wines as well! 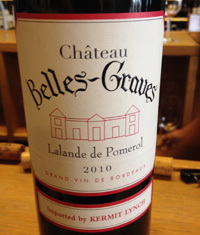 2010 Château Belles-Graves, Lalande de Pomerol, Red Bordeaux, France. Belles-Graves dates back to the 16th century, this pre French Revolution has changed hands a few times in it’s lifetime, but now remains in the heirs of Hermine Theallet since 1938 with Xavier Piton, a relative of the famed under sea explorer Jacques Cousteau, in charge today. This secluded and idyllic Chateau is surrounded by mostly Merlot vines, though there is a good plot of Cabernet Franc that adds complexity to this classic Lalande de Pomerol with the Grand Vin made up of 88% Merlot and 12% Cabernet Franc. 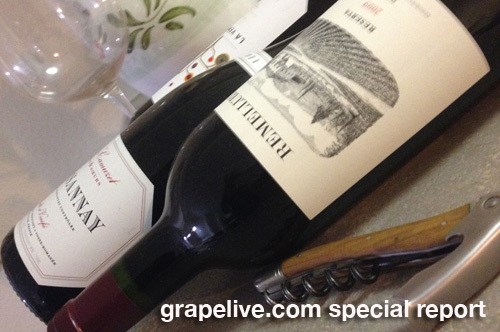 With a great vintage, like 2010, it is hard to wrong and certainly Chateau Belles-Graves got it right, making a stylish and full bodied Claret that is not only lush and delicious now, it can age gracefully for another 5 to 10 years easy. The nose is full of acacia and dark floral tones along with creme de cassis and with a hint of mineral/pencil lead, leading to a plush mouth filling palate of blackberry coulis, red currants, cherry and framboise plus hints of vanilla, graphite, char, briar and cedar. Good drive and polished tannins keep the vigor in this Bordeaux along with a lift of gentle acidity and the long fruit filled aftertaste. This is one of jewels in Kermit Lynch’s Bordeaux portfolio, if you are looking for a super drinking Bordeaux and don’t want to break the bank this would be an excellent choice! 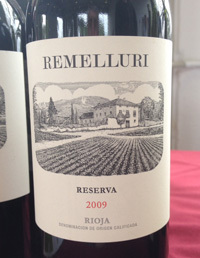 2009 Remelluri, Rioja, Reserva, Spain. Telmo Rodriguez returned to his family estate in 2010, but had plenty of time in the cellar to separate lots and refine the blend in this sublime Rioja that for the first time in modern history was all estate grown, with the purchased old vine fruit going into the Lindes de Remelluri bottling. Telmo has great plans for this glorious estate wine, and his estate white, the Remelluri Blanco is already seeing his vision come into focus, he plans to model the red along the same lines, he will add more varietals each year until he has up to 9 or 10 different grapes to the classic mix of Tempranillo, Garnacha and Graciano, his idea is craft a unique field blend that is proprietary to Remelluri a more complex and exotic wine. I can see why, as his Blanco proves he’s on to something special here, the terroir is ideal for this too with slopes and high elevation Remelluri has it’s own sense of place, quite different to other properties in Rioja, Remelluri is literally on the edge with a mix of soils and it’s own micro-climate in Rioja Alavesa. 2009 was a warm and generous vintage, and the Remelluri is full of richness and texture with ripe tannins and wonderful length, Telmo’s masterful touch in blending gave this wine a graceful almost Burgundy like feel, it is rich without being heavy, no mean feat in this vintage. Pretty red fruits, earth, spice and subtle wood notes all play important roles here with raspberry, cherry and dark plum. There is texture and layers here, with hints of game, exotic spice, truffles, anise, cedar and warm stones, this is an interesting wine and it sets the senses alight, drink now and through 2019. Be sure to keep an eye out for future releases of Remelluri, and don’t miss the Blanco, the 2011 is stunning! 2012 Agricola Cirelli La Collina Biologica, Montepulciano d’ Abruzzo DOC, Italy. Francesco Cirelli has an organic farm in this hills of the Astri Abruzzi zone, his estate produces a fine selection of organic products from olive oil to ice cream, but it is his wine that are really grabbing the headlines, with red (Montepulciano), white (Trebbiano) and rose (Cerasuolo) on offer. These sandy and chalky hillsides, sandwiched by the Adriatic and beautiful National Parks are the perfect home for the native Montepulciano, a very dark skinned varietal (believed to be a long lost family member of Sangovese, though now considered very much it’s own grape) that is rich in color and can be age-worthy. Cirelli’s latest offering is a special Amphora raised version of Montepulciano d’ Abruzzo that has almost nine months on the skins, this adds up to a exotic example and a very unique expression of this varietal and terroir, making for a rich and flavorful red. The nose is grapey and there is some spice, crushed flowers and loads of mineral essence leading to a grippy palate of wild plum, blackberry, cherry and dark currants along with anise, touches of earth, blueberry skin and saline/savory notes. This purple/ruby hued red is very intriguing and compelling with a rich character, but with brightness and fine grained tannins, it finishes with class and pleasing length, drink from 2014 to 2016.